Is travel to Antarctica one of your lifelong dreams? Well we want you to get there sooner, so for a limited time we are giving you the chance to get $50 credit towards ANY of My Antarctica’s programs. That’s $50 towards any of My Antarctica’s cruise and tour programs to the icy continent. And we’ll even let you use this on top of any existing Early Bird Promos or Antarctic deals that come along. Just because, we’re generous that way. And you have plenty of time to make up your mind about what is your best way to explore Antarctica as you have until 31 December 2016 to apply it. 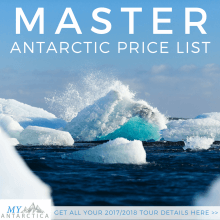 Meaning, you can still book and hold your place for an Antarctic cruise tour for the 2017/2018 season and reap the reward. The only catch is that you have to register below to claim your My Antarctica Launch Offer below. There are only a limited number of these available, so register today to claim yours.